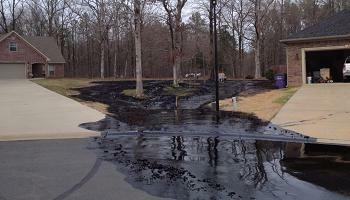 A federal judge has denied a request by ExxonMobil to throw out a joint federal and state lawsuit that seeks to penalize the company for a pipeline spill that dumped an estimated 150,000 gallons of crude oil in a central Arkansas neighborhood. U.S. District Judge Kristine Baker on Monday issued an order saying U.S. Attorney Christopher Thyer and Arkansas Attorney General Dustin McDaniel sufficiently stated a case that ExxonMobil violated the law to warrant going to trial. The company's Pegasus Pipeline ruptured at Mayflower on March 29, 2013, sending crude oil into a cove at Lake Conway and causing the evacuation of 22 houses. Baker ruled that the suit sufficiently alleges violations of state and federal law but left the door open to dismiss some of the allegations later.